Okay, I cheated ... They're "cheat chocolate croissants". The pastry is already made, so it's more of an assembling task than actually cooking. But these are for mornings, and no one will get up at 3 am just to make some croissant dough. Most people will, however, buy a packet of puff pastry at the grocery store and make something quick and delicious with it on a special morning. So that's what I did today. I was feeling home-sick, being away from Paris so long, so I made a typical Parisian breakfast; a petit déjeuner. 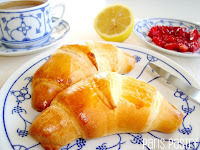 A croissant or two, a café au lait, and some fresh Summer berries made my day morning! Rating: 5 out of 5. 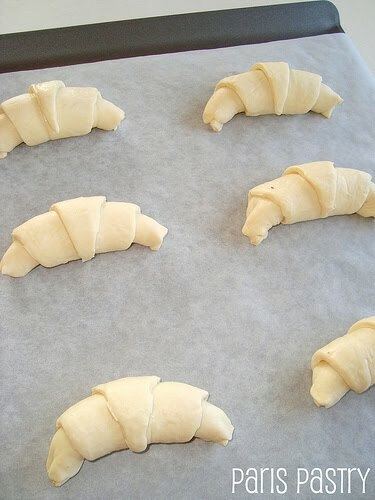 - Unfurl the sheet of pastry and then cut it into 6 squares. Cut each square diagonally to give 2 triangles (they will appear quite small). Put the triangle with the wider part facing you and the point away from you. 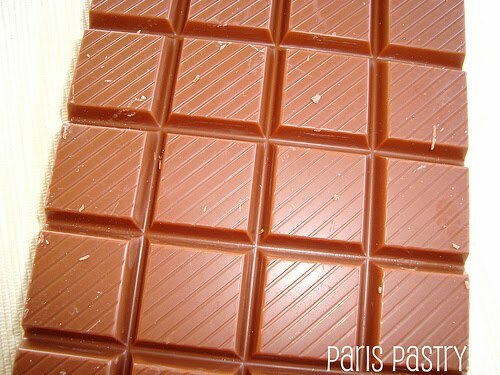 - Break off small pieces of chocolate (approx. 1cm/half inch) to place about 2cm/¾-inch up from the wide end nearest you. Then carefully roll from that chocolate loaded end towards the point of the triangle. You should now have something resembling a straight croissant, seal it slightly with your fingertips and curl it around into a crescent. 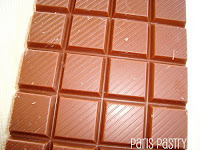 - Place the chocolate croissants on a lined baking tray and paint with the beaten egg. Bake for 15 minutes until golden and puffy and exuberantly, if miniaturely, croissant-like. All-in-all these took about 30 minutes to make. I used my very new, very expensive bar of Valrhona chocolate for these croissants. I paid 4,95 euros ($6.05) for 250 grams! 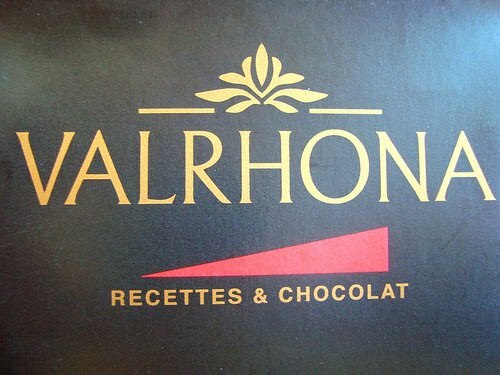 Most pastry chefs recommend Valrhona chocolate. I live for breakfasts like these. I never get tired of oozing, melted chocolate! Oh, and to see Nigella Lawson make these click here! These look so yummy! 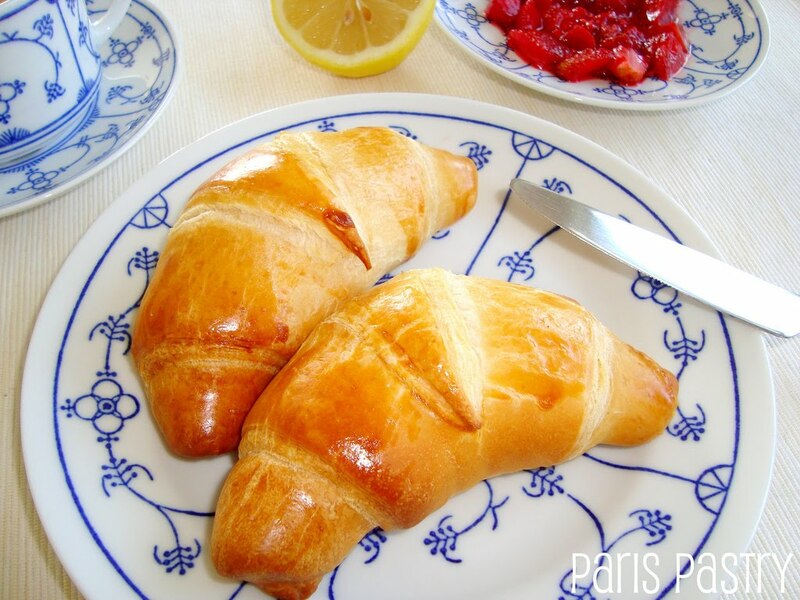 Who would say no to croissants with Valrhona? Mmm! About the cheesecake crust on my post, I actually think mixing the graham crack crusts with softened and not melted butter makes a huge (positive) difference in the texture of the crust! I never get tired of oozing melted chocolate either! Sigh!!!!!! Have a great weekend! I just watched "I's complicated" this week for the first time, and I have been craving chocolate croissants ever since!! Have you seen that movie? Ok, I am going to have to make these for our Fourth of July guests! I bet they're tasty and they look like they took forever to make. But you're helpful pictures make them seem very doable! Hey - puff pastry is there for a reason. To use it! These look perfect. You are amazing.... these look so yum and I use puff pastry as well! I don't really think its cheating.... I call it being time effective! I think yours would be nicer than NIgella's! Have a lovely Friday! Chocolate croissants...my favorite thing!!! Thank you so much for this recipe. Sounds great to me! Someone from another blog just asked me if I knew of a recipe for this! What a coincidence. I will direct them to here! Who knew you could bring Paris home so easily!? I am craving these so badly now! wonderful and easy recipe! I think I will be trying it shortly...yummy!! i made this but got disappointed by the result, maybe it was the puff pastry.. not the quality puff pastry. 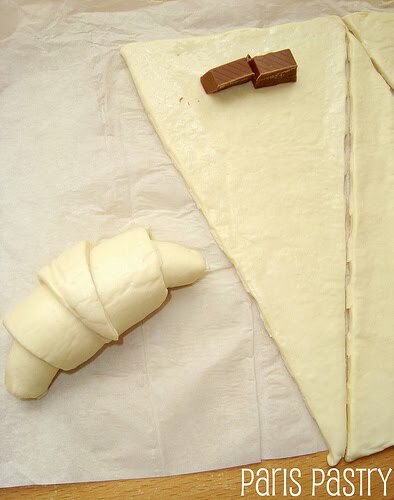 Oh wowww that picture of the oozing chocolate out of the croissant looks so good! yes- i will be making these soon. they look soooo good! i love the tip of adding sugar to the beaten egg. perfect!! i love, love your blog!! I'm gonna surprise my husband with this for breakfast this weekend! Good (and fast!) idea! Oh wow! These look so delicious! If only I could join you in Paris for breakfast to eat one of these! Yummo! Nice call on the Valrhona! 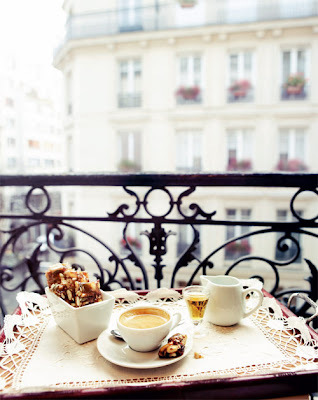 I'd love to stop by for breakfast! The croissants look absolutely beautiful. 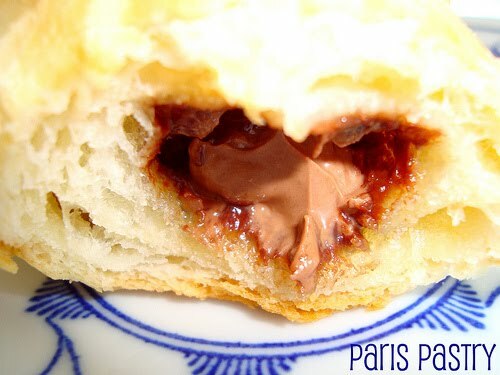 But just a thing, you can never find chocolate croissant in Paris or in France, only "pain au chocolat" or "Croissant au beurre" not a mix of thos two things!! @GrandeMarine: That's true. I thought it would be fun to mix a croisant and a pain au chocolate together! I think I just died and went to heaven...so lovely!